Simon, demon fiddler. Learnt classically. 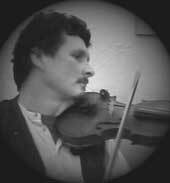 Recovered in early 20s, having discovered celtic music. Hitched with fiddle around Scottish islands for inspiration. His playing sparkles, sometimes with the flash of mad bluegrass fiddling, other times with the subtle lilt of the celtic tunes; Sometimes a heart-rending lament. His mastery of many styles lends the music authority and richness of texture, as well as heart and depth. Likes to sail boats around the exquisite coast of Southwest England. 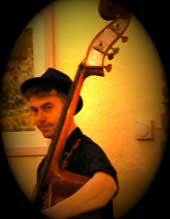 Tim, double bassist extraordinaire. The big heartbeat, a driving force....and with the deepest voice in the world. But also guitarist of great competence, with a love of gypsy swing. Persuaded into the ranks of SOL in 2001. Deviation into klezmer clarinet, adding another, wilder dimension to the music, while the eerie sounds of bowed bass resonate through the repertoire. Likes to climb mountains in driving sleet in January; and rescues people who get lost or injured on Dartmoor. 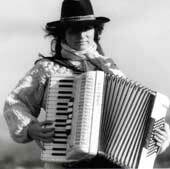 Lynn, amazingly versatile player of a beautiful Italian accordion. Adds some flashy finger-work to the tunes, and holds the centre ground, with great warmth and energy. Got an accordion, got a party, as they say. Lynn is also a fine pianist. Sometimes she is moved to sing a song in one of the languages she likes to collect, from Romany to Yiddish to Cajun French. She can call dances from the celtic lands, as well as village dances from Europe. She likes to write fanciful stories and is finishing an esoteric eco-thriller at present.